At the start of the film, Leo washes up on a rocky shore, and is brought into a Japanese palace. at 5970 Palos Verdes Drive South, in Rancho Palos Verdes, CA. "My father doesn't want me to be him." This is actually the corner of Wilshire Blvd and Hope Street, in downtown Los Angeles. and convinces him that he's dreaming, but to trust him as his dream security. Given that circular concierge desk, at first I assumed it was actually a hotel. located at 2000 Avenue of the Stars, in Century City (Los Angeles). and you can see the striped floor inside, and part of that circular desk. a rocky beach, where Leo sees his children playing in the sand. at 32100 Pacific Coast Highway, in Malibu, CA. Here is a Google StreetView panorama of nearby rocks at Leo Carillo. This buildings seen are on the 600 block of Wilshire Blvd - between Grand & Hope. camera looking east down Wilshire (away from Hope, towards Grand). Here's a matching Google StreetView) for the screenshot above. Here's a matching Google StreetView for the screenshot below. The waiting man is picked up by car (driven by Leo, and with Joseph Gordon-Levitt in it). on him and tells him to walk away, then steals the taxi. just a few yards east of the street corner where the man was waiting. Here's a matching Google StreetView of the screencap below. After stealing the taxicab, Leo stops and picks up his unsuspecting victim, at a street corner. One inside, they draw guns, and the taxi pickup turns into a kidnapping. and the same intersection where we saw that "Famima !!" store earlier. They just keep switching corners, but remain at that same intersection. taxi kidnapping scene was shot on the northwest corner of Wilshire & Hope, at 707 Wilshire Blvd. Here is a Google StreetView of the screencap above. Next, Leo stops and picks up Ellen Page in the rain, just before the train appears. one of several storefronts on the bottom floor of the building at 704 S. Spring Street. Here's a matching Google StreetView - of the screenshot above. Suddenly, out of nowhere, a train appears and roars down the middle of the street, smashing cars out of its way. as it first barrels through the intersection of Spring and 7th Street. In the shot above, the camera is looking southwest from the northeast corner of Spring & 7th. Here's a matching Google StreetView of the screenshot above. In the shot below, those awnings are on the west side of Spring Street, just north of Spring. Here's a matching Google StreetView of the screenshot below. 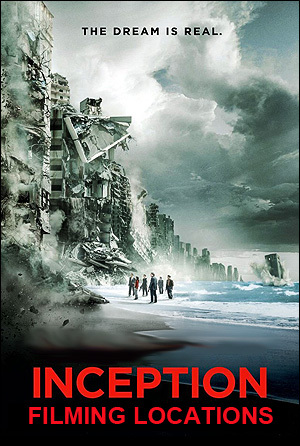 The photos on this page are stills from "Inception"